Okay, sorry about the delay in posting the winners of the Timbuk2 bag raffle and pint glass. There are many situations that have come up in the past couple of days which required my attention. I’d like to thank the academy, the fans who voted, jesus…. Oh man, now the music started. No, THANK YOU! Shane has the right idea. He buys lots of tickets. However, I want to offer a generous thanks to everyone contributing, it is amazing. I added up all the totals that have been donated. This includes cash given to me on the road as well as the $807 that was raised by participating in the CLAW event and the $100 dollars from the CCPJ in Charlottesville. Now, Genuine kindly donated $1,000. This means that they alone raised $600 for donation. Really, the goal is honest and simple. $1 per 1 mile driven. More than half of that, 60% is divided between four organizations. Let me emphasize that two of those have been chosen. I am volunteering at organizations along the route in hopes to make a decision between the final two. All monies will be donated at the end. My hope is that I will be able to give even more than the .60cents per dollar. So far, P.E.A.C.E costs have been minimal. I want to bring awareness to my financial situation. I don’t have financial backers. I didn’t have a lot of money saved, but I had some. I also have a small job I can do from the road, which covers costs getting town to town. Genuine has agreed to sell shirts for me, and after costs, $5 of the sale goes to P.E.A.C.E SCOOT. However, that $5 goes straight into the fund raising pot. And how about that pot?!!! What you see on the chipin is not totally accurate. It gets better. Some donations have been made straight through paypal, which is not reflected in the chipin. The total raised so far is $4,175.15. This means that $2505.09 has been fund raised for donation. $1,252 left for donation between two other organizations. I’m just tickled pink! Don’t forget that your opinion is always appreciated. If you want to recommend a great Environmental organization and Community minded organization, PLEASE send me an email! You can win it for as little as $5. 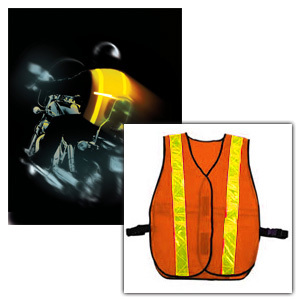 Take a chance on the vest…not on the road.